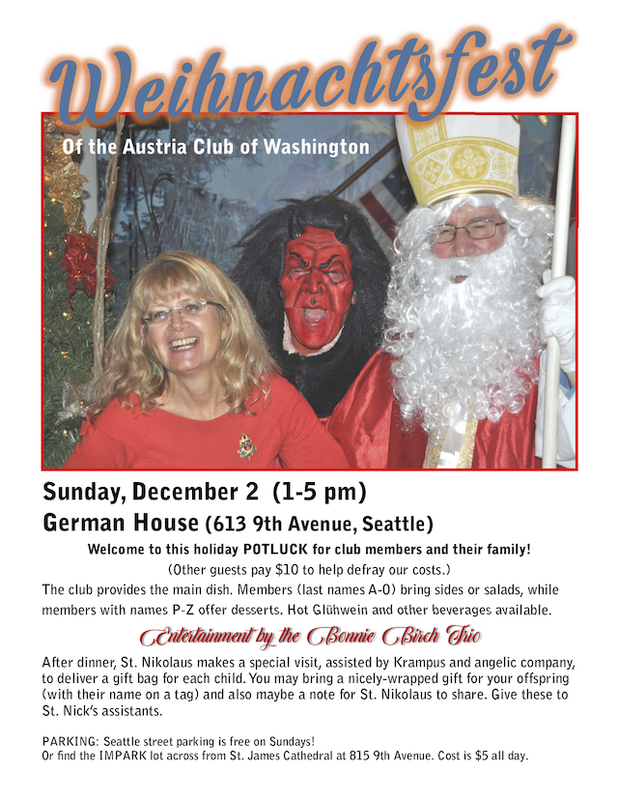 The public is invited to Austria Club of Washington traditional Weihnachtsfest. It will take place on Sunday, December 2 from 1-5 pm at the German House 613 9th Avenue, Seattle 98104 between St. James and Harborview. Although promoted as a club member potluck, other guests can contribute $10 or a dish toward defraying event expenses and so participate in the seasonal festivities. There will be hearty Glühwein (mulled wine) and other beverages, and the Bonnie Birch Trio provides entertainment. Shoreline residents Bob Otto, Maureen O'Neill, and Martin Kral represent the customary trio of St. Nikolaus, Krampus, and Angel, so typical for an Austrian Christmas. Each child is given a Krampus Sackerl of goodies (nuts and chocolates). Parents are encouraged to turn over a wrapped and marked gift for their child that St. Nick then can offer to that boy or girl.